The perfect getaway for cyclists, walkers and those just wanting a relaxing break to enjoy the spectacular countryside. The Granary is a one bedroomed apartment, adjacent to the owner’s home, set in a wonderful position with views across the countryside. The location is near enough to a main road to make getting around this wonderful part of the world easy. Sitting on the edge of the North York Moors National Park and with the Yorkshire Dales National Park just a short drive away, this really is a wonderful place to stay. The Granary is a haven for cyclists with a bike store incorporating a drying locker/cupboard. It also has a work station with tools for making adjustments and an outdoor hose for cleaning up after a day in the countryside. There are several famous routes to take in such as Boltby Bank, Cote De Sutton, which features in the Tour De Yorkshire, and White Horse Bank. The property is even located along the route for the 2018 Tour De Yorkshire, and overlooks the route of Peleton as it passed between Thirsk and Northallerton, along the A168. There is plenty for the mountain biker too including the climb from Hunters Hill to the top of Black Hambleton Cairn if you like a challenge. The Cleveland Way runs nearby and is perfect for cyclist and walkers alike, or for the casual walker there is Sheepwash, a popular picnic spot north of the Osmotherley, it was once a watering place on the ancient drovers’ road over the moors to Yarm and the River Tees. Combined with a walk around the nearby Cod Beck Reservoir, surrounded by woodland, this is a picturesque and easy stroll of around 2 miles. The cobbled market square in the centre of Thirsk is where you can enjoy the interesting inns and houses, many dating back to the 18th century, when Thirsk was an important posting station. Thirsk’s oldest inns include the Three Tuns dating back to 1698 and The Golden Fleece that is thought to date back to Tudor times. There are also plenty of traditional shops, restaurants and tea rooms to choose from, and Thirsk even has its own racecourse if you fancy a bet. 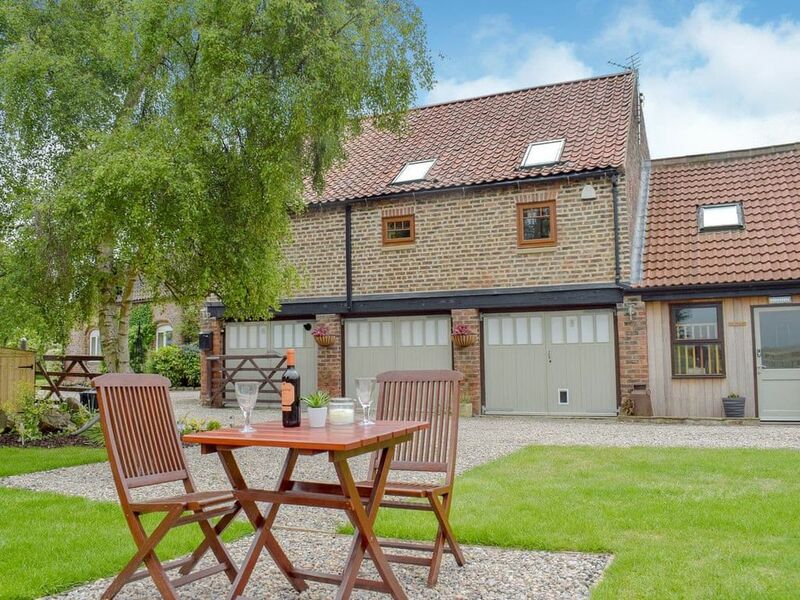 Thirsk is the principal market town of the Hambleton Hills, forming the western part of the moors and is a haven for keen walkers and cyclists with numerous pathways and cycle tracks close by. The North York Moors comprises the plain of Cleveland to the north, and the Vales of Pickering and York to the south. The National Park is at its scenic best in August and September, when the purple heather is in bloom. The Cleveland Way National Trail also runs through the village, while Wainwright’s famous Coast to Coast walk passes close by. Other places well worth a visit nearby include Helmsley, Rievaulx Abbey, Mount Grace Priory, Hutton-le-Hole, Thornton-le-Dale and Goathland, also known as ’Heartbeat’ country. The town of Northallerton is just a drive or bus ride away, which has been an established market town since the 1200s. The medieval walled city of York is well worth a visit or a trip to the seaside with the gothic fishing town of Whitby, just an hour away. Shop 2 miles, pub and restaurant ½ mile. Living area: With electric coal-effect fire, 46" Freeview TV, DVD player with a selection of DVDs and double sofa bed (for flexible sleeping arrangements). Gas central heating, electricity, bed linen, towels and Wi-Fi included. Travel cot. Welcome pack. Laundry service available. Enclosed garden. Bike store. Private parking for 1 car. No smoking. The Owner will provide a laundry service, if required. Sofa bed available for flexible sleeping.